The result of Lip's hurried phone call to Barry Coker was that Patrick Wright was chosen as Burns successor. Both agent and artist were not surprisingly extremely pleased at this turn of events, as although the pressures of illustrating a daily strip were immense, the rewards were certainly a lot more generous than IPC or DC Thomson page rates. For Wright this would be a real step up in terms of remuneration. 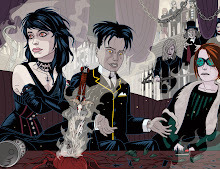 So whilst John Burns continued to work on Blaise, unbeknownst to him his successor was also producing artwork for the same script, thus allowing Lip and his team to decide at which point Burns work should be terminated and Wright's inserted. As a consequence there were twelve days of Modesty Blaise where both artists were illustrating the same story. Patrick Wright's work on the story was a marked contrast to all the artists that had preceded him, with an economic use of solid blacks and a complete absence of the half tone hatching favored by both Holdaway and Burns as can be seen by these two tiers of Blaise dailies, the first being Burns work followed by Wright's. In truth the deviation from the Holdaway imprimatur might have been too much for O'Donnell and after only one and a half stories suddenly there were no more Blaise scripts for Wright to artwork. It was then down to Barry Coker to phone Lip to receive the bad news - this being the way that such brutal decisions are effected in Fleet Street - easier to be the conveyor of good news rather than the devastating blow to self confidence as well as standard of living that such a rejection creates. The next artist to be selected was the New Zealand artist Neville Colvin and Colvin it has to be said was in many ways the closest to Holdaway that O'Donnell could have hoped for. 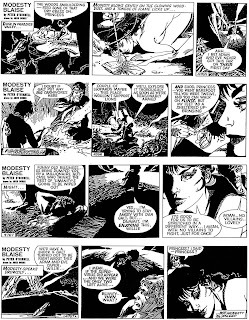 When Neville Colvin accepted the Blaise brief he was in his early sixties and still at the top of his game with a lovely dynamic style of drawing perfectly suited to the demands of O'Donnell, who in fact had collaborated with him some years earlier on an abortive project to create a Modesty Blaise Sunday strip. Colvin continued on the strip until 1986 when at the age of 68, with a total of 1.902 Blaise dailies to his credit he effectively retired from the strip and pretty much retired from drawing. Here are some samples of his work and more can be read about this fascinating artist at a site dedicated to the artist. Went to the Bristol Con last year and Burns did me a wonderful Judge Dredd it was only while he was drawing it I saw some Modesty Panels behind him and it clicked that he had drawn it for a while. An opportunity missed to get him to do a Modesty, still always next time! John did quite a few of the covers for the first series of Titan reprints of MB and they're all stunning. His work has just continued to get better and better. His Jane Eyre for Classical Comics is a real tour de force. Thanks for joining my band of followers, Peter......sorry I've shunted the message in here. cheers, Rab Smith. [Baby Boomer site]. I'm rather flattered by that description, Peter!